STORRS - After seeing his UConn women’s basketball team’s streak of 12 consecutive years as a NCAA Tournament No. 1 seed end on Monday, Geno Auriemma needed 14 words to put it in perspective. “For us to be a No. 1 seed we almost have to go undefeated,” the Huskies’ coach said. UConn (31-2) is seeded second in the Albany (New York) Regional and will begin their bid for a 12th straight Final Four berth and 12th national championship against No. 15 Towson out of the Colonial Athletic Association on Friday at Gampel Pavilion. The Huskies (RPI 6, strength of schedule 31) were beaten out for a top-line spot though they had beaten one No. 1 (Notre Dame) and lost to two (Baylor and Louisville), all on the road. Those three all had a better RPI and SOS than UConn. However, Mississippi State, the top seed in the Portland (Oregon) Regional, trailed the Huskies in RPI (8) and SOS (43). The Bulldogs are 30-2 with losses at Oregon and at home to Missouri. Did UConn’s past success - the Huskies entered four of the previous tournaments unbeaten - work against it? Playing 19 games in the American Athletic Conference, which was ranked ninth among conferences in RPI, took a toll. Within the league, South Florida was a top-25 team in November before losing its three top players to injuries. The Bulls still managed 18 wins and received a WNIT bid, but finished with a RPI of 115. Central Florida (26-6) had a RPI of 15 but was the lowest at-large seed placed in the tournament. The No. 12 Knights play a first-round game against Arizona State in Miami, Florida. What also hurt the Huskies is what looked to be a strong 14-game non-league schedule did not turn out as it appeared it would. UConn played six out-of-conference teams in the Field of 64, with all but California (42) having RPIs in the top 20. But five others - Ohio State, Oklahoma, Purdue, St. John’s, and Seton Hall - who figured to be in the postseason mix struggled. Ohio State (15-15) missed the NCAAs for the first since 2014 and had an RPI of 101. Oklahoma (8-22) saw its run of 19 straight NCAA bids end. Purdue (19-15) had missed the NCAAs only three times in the previous 25 years. St. John’s (15-16) had been in six of the previous eight tournaments. And when the home-and-home series with Seton Hall (15-15) was put together, it was coming off back-to-back NCAA berths. Saint Louis (15-16) and Vanderbilt (7-23) were scheduled to put together homecoming games for Napheesa Collier and Crystal Dangerfield, respectively. “What’s out there a lot of times is, ‘Well, in the polls you’re No. 2,’ ” Auriemma said. “That doesn’t really mean anything when you put all of the numbers together. You can’t go by that. I do think we did a lot of great things this year. Sometimes you get lucky and sometimes you get penalized. 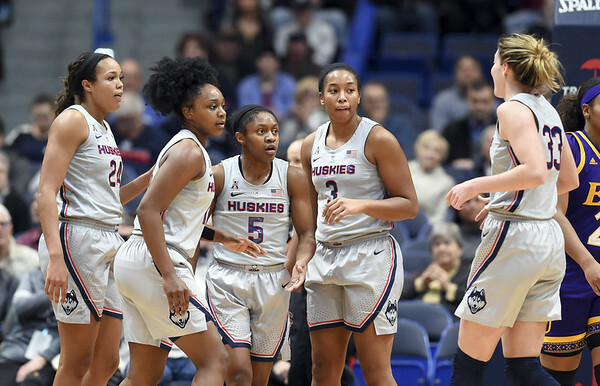 For those scoring at home, the Huskies will play seven 2019 NCAA teams - Baylor, California, Notre Dame, Oregon, and Tennessee at home, DePaul and South Carolina on the road - on their non-league schedule next season. The last time UConn was a No. 2 was in 2006, when it lost in the Bridgeport Regional final to Duke in overtime. The Huskies won the 2004 title behind Diana Taurasi as a 2. “We’ve lost national championships being the No 1 seed, and we have won national championships being the No. 2, so I don’t think it matters one way or another,” Auriemma said. “I mean we did lose two games so I am surprised we are a No. 2. I thought we’d be like a No. 4 or a No. 5. The No. 2 seed did get seniors Collier and Katie Lou Samuelson another chance to play on campus. If the Huskies defeat Towson, they will entertain No. 7 Rutgers or No. 10 Buffalo on Sunday for the right to advance to Albany. UConn has reached the Sweet 16 in 25 consecutive tournaments, the longest active streak and two behind Tennessee’s all-time record (1982-2008). “In terms of playing it doesn’t mean much,” Collier said. “We still have X-amount of games to win. I thought it was pretty crazy that we were a No. 2 seed, but we’re still going to prepare the way we were before and it doesn’t change much in terms of how we are going to play or what we want to do in the tournament. Posted in Newington Town Crier, UConn on Wednesday, 20 March 2019 20:45. Updated: Wednesday, 20 March 2019 20:47.